I’ve never been to the Oregon coast before, so I decided it would be a good local trip I could take with the dogs. The winter mid-week deals at the Surfsand Resort were too good to pass up! I got a fantastic oceanfront 1-bedroom with a gas fireplace, soaking tub, and tempur-pedic king bed. Dogs were welcomed with treats and beds and towels. It was great to walk on the beach, especially on Wednesday which was sunny and 50 degrees. It was also great to have a night with my friend Miranda, who came out from Portland with her dog Kaya. 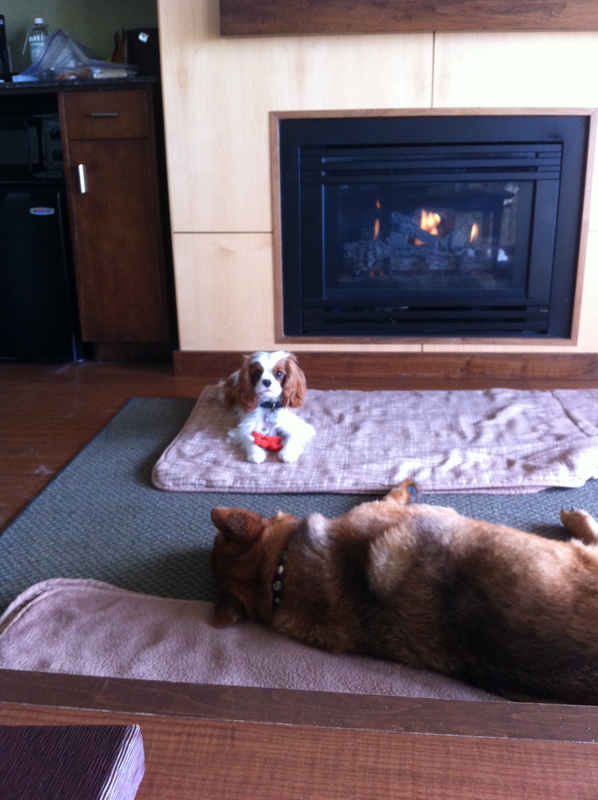 After all that running in the sand, the dogs loved taking naps in front of the fireplace. I love our house on Whidbey, but there is something special about being on the ocean. The sound of the waves is perfect! I hope to get back to Cannon Beach one more time before summer hits and there are a zillion people there. I know it’s more expensive in not-winter, but we should go back there again soon. We really loved that room and the dogs were THRILLED.